At the end of February 2019, The UAE Tour was on. This bicycle road race covers almost 1,200km throughout the country. Who Are Team Novo Nordisk? 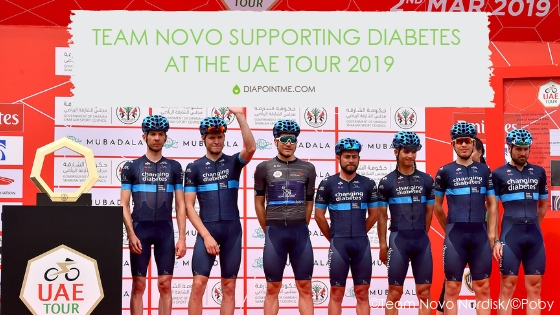 Team Novo Nordisk were back in the UAE in 2019 to participate in the inaugural 2019 UAE Tour, after taking part in 2018 in Abu Dhabi (prior to 2019, Dubai and Abu Dhabi had separate tours). We only learned about this cycling team last year by accident when my parents were visiting us in Dubai from the USA, and they saw the 2018 Dubai Tour being promoted on a local sports station. My father told me an announcer had mentioned that the athletes from Team Novo Nordisk taking part had Type 1 Diabetes. I was shocked and excited at the same time. What? A team of professional athletes who all have Type 1? We have met competitive athletes and professionals who have Type 1 Diabetes before, but to see an entire team of elite cyclists with Type 1 Diabetes was amazing. My son’s perspective about his diabetes shifted last year when he met Quentin Valognes, who won the sprint jersey in the 2018 Dubai Tour, and Team Novo Co-Founder, Phil Southerland. After I saw this shift, I wanted nothing more than for others with diabetes to experience the same thing. So of course I told everyone that I know to go out to the 2019 UAE Tour and support Team Novo. If you follow DiapointME on social media, then you probably saw our posts about it. We went to several stages of the race and it was so inspiring to see the team and inspiring for those with diabetes, particularly Type 1, to meet the team. Team Novo Supporting Diabetes… And My Son! Cyclist Sam Brand rode the entire race with Erin’s name on his bike from Stage 2 – approximately 1,074km! It is definitely something my son will never forget, and it has boosted his confidence in his ability to live with diabetes. As a parent, I am so happy that my son has such a positive role model. Thank you for encouraging us to go out to the race. Such a big day for us to see others in the same situation achieving success. My daughter was on cloud 9 she was so excited and couldn’t believe that they do everything that she does on a daily basis and still manage to cycle for 3–4 hours straight. As a parent it’s a wonderful feeling to get a glimpse into your child’s future and know that they can live happy, healthy and successful lives. It’s all about believing it. We were so excited to see Charles Planet defend the sprint jersey throughout the race. It is amazing to know that diabetes does not hold any one of these guys back. To actually see them in person and know that they all have Type 1 is so inspiring! The impact of athletes like Team Novo supporting diabetes is not limited to a single day of inspiration. Their positive and affirming impression is still with those who met them. One mom was just telling me how her son, at age five, used Team Novo as an example as he advocated for himself at school. Another parent is already rallying the community here in Dubai to get together to support Team Novo at Stage 1 in 2020. Team Novo is now starting their European tour and are in Italy as I write this. Follow Team Novo on social media, and check their website to see when they are coming to a city near you. They compete all over the world. I highly recommend getting out to a race or an appearance to meet Team Novo Nordisk. You will leave nothing short of inspired to chase your biggest dreams. If you are interested in being a Team Novo Fan of the Race, you can apply here.